The 6mm Flying C' is available in 10g, 15g, 20g, 28g or 34g. Assembled using extra strong 0.9mm stainless wire with a high quality Eagle Claw treble hook with the option to upgrade to a single or treble Black Chrome extra strong and sharp hook. Finished with a premium teardrop, spinner blade and stainless bearing bead. We like to think we've perfected this classic Salmon lure. The 6mm Flying C' is available in 10g, 15g, 20g, 28g or 34g. Assembled using extra strong 0.9mm stainless wire with a high quality Eagle Claw treble hook with the option to upgrade to a Black Chrome extra strong and sharp single or treble hook. Finished with a premium teardrop, spinner blade and stainless bearing bead. We like to think we've perfected this classic Salmon lure. Choose weight, spinner blade finish, hook type and the lure body from the double colour Latex lure body range. Choose weight, spinner blade finish, hook type and the lure body from the Metallic colour Latex lure body range. Swivels (Ball Bearing) Original or S.P. We are situated in Ribchester, Lancashire. You are welcome to visit our manufacturing unit and shop (Monday to Friday). Click here for directions. We are near the banks of the River Ribble off the A59, just 15 mins from M6 - J31. Please telephone if you prefer to order directly or if you have any questions. We pride ourselves on our fast and efficient personal service. 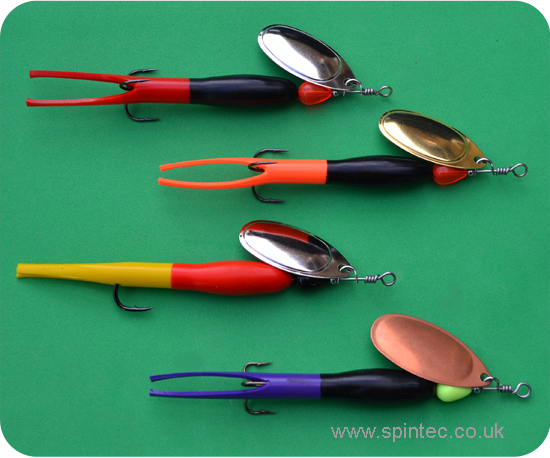 We believe the Spintec Flying C' is the most successful Salmon and Sea Trout lure in the UK. 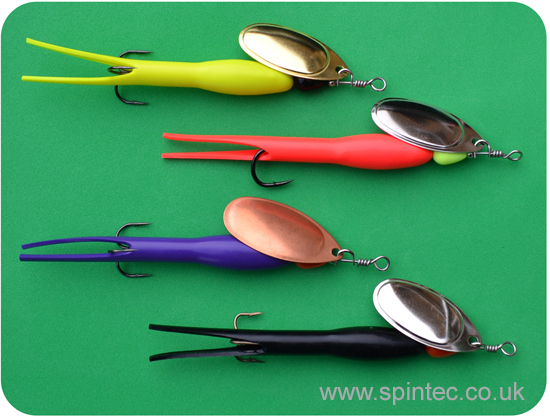 Spintec supply assembled lures or components for you to make to your own requirements. Spintec manufacture the widest range of Flying C' colours and weights on the market. Fully assembled lures Blair Spoon, Devon Minnow, Flying Condom, Flying Bullet Condom, Latex Genie Flying C', Flying Bullet C', Latex fly, Latex shrimp and Rubber Zulu. Fishing lure components Barrel leads, Non-lead weights, Bullet Bodies, Teardrop Beads, Metal beads, Clevis, French Blades, Indiana blades, Swing Blades, Ripple Blades, Latex Flying C' lure spinner bodies, Silicone oil, Stainless Split rings, Stainless wires, Spintec Original Ball bearing swivels, bb swivels, Tools, Treble hooks, Single hooks & Zulu bodies. Fishing lure tools Round nose pliers and split ring pliers.